Over the past couple of months I have been fortunate to be able to mentor a new competitor. Shane Sapp of Quarter Ton BBQ (here in the Boise area) competed in his first competition earlier this month at the Big Chill Cook-Off in Kuna, Idaho. I have to say that Shane is a fast learner and he had that fire in the belly that you really can't coach. He cooked like an absolute trooper, despite some nasty weather, and did very well. Oh, and he saved my bacon with a sleeping bag and tent heater when I locked my keys in my truck. Me: Overall, was your first competition experience better, worse, or about what you expected? Why? Shane: Honestly, it was about what I had expected. It was a great experience. I think it was primarily because I had the luxury of a veteran competitor showing me the ropes. 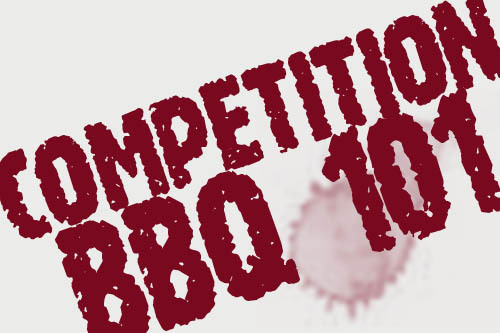 Also, your blog gave me a pretty good rundown in your "Competition BBQ 101" series. Me: What things, if any, did you learn during the competition that you would rather have learned before you got there? Shane: Nothing really stands out as far as the competition side of things goes. Again, I had a pretty solid foundation built by my mentor. Maybe some details about the individual event, like the venue layout, would have been nice to have, but there are probably last minute details that affect the planning. Me: What is the single biggest mistake you feel you made during the competition? Shane: Going back to the whole mentor thing again, I ignored the advice I was given about my sauce. I decided to use something that I liked instead of one that might appeal to more people. To make matters worse, I didn't heat it up when I applied it to my two long cook meats. Also, I probably rushed my turn in boxes when I didn't need to. Me: What part of the competition did you enjoy most? Least? Shane: I really had a good time during turn-ins. I don't know whether or not that will sound funny to the veterans. It was rewarding to see what had started, for me 15 hours earlier, all come together. I had a high level of adrenaline and was excited to get my boxes turned in, in anticipation of the judging. Every other competitor you passed wished you good luck with a genuine smile on their face. They were good group of people for sure. As far as the least enjoyable part, it did get down to 29 degrees during the overnight portion of the competition -- chilly. Me: What comments or pointers would you like to share with other would-be competitors? Shane: I would have to echo what both Hoss of Big Daddy BBQ and you told me -- use the internet. There is a ton of information out there. From YouTube to Greg Rempe's internet radio program, there are a lot of people showing and discussing how things are done. Community forums, like the Utah BBQ Association and The BBQ Brethren are great sources of information and feedback as well. I am not talking about getting "secrets" per se, but building blocks that some folks are offering out there that you can build on and make something of your own. Above all, have fun with it! Thanks for your thoughts and very kind words, Shane. It was truly a pleasure to help show you the ropes and, of course, to cook along side you. I look forward to doing it again soon. I encourage all of my fellow competitors out there to find someone who is curious and mentor them. We need to be looking to help those who are up and coming.